We’d love your help. Let us know what’s wrong with this preview of The Trouble with Time by Lexi Revellian. It's 2045. Jace Carnady works for the Time Police, dedicated to the prevention of timecrime. Life is good; he loves his girlfriend and enjoys his work. But when the team gets wind of a rogue time machine and fails to find it, Jace suspects one of his colleagues may be involved, and his life begins to unravel . . . In 2015, Floss Dryden is snatched from her own time and taken to the future – but will this really prevent the extinction of humanity? To ask other readers questions about The Trouble with Time, please sign up. The Trouble with Time (Time Rats #1) by Lexi Revellian is a pretty good time travel book. I read the second book first and liked it and just now getting to the first one. I liked it but I think book 2 was better. It got a little confusing in places and I had to re-read it but mostly it was pretty good. They are like time cops and then they has to deal with a rogue machine but there might be a insider that has gone bad. Interesting and kept me reading. Great start to this time traveling series!!! This was great from start to finish. Excellent character development and there are plenty of interesting characters including a German Shepard. There are a few jumps that will keep you on your toes. This was a really nice easy read and that finished faster then I hoped. I'm really looking forward to the next book. The author is one of very few whose work I will buy without hesitation, because I’ve never read a bad one yet. This one didn’t break the pattern, but for me it wasn’t quite the unalloyed pleasure of her previous books. This is mostly because of the time travel theme, one that I find tricky at the best of times. I like a nice, linear plot that proceeds at a steady pace from A to Z without too many meandering deviations. Time travel stories start at A, but after that all bets are off. They may pro The author is one of very few whose work I will buy without hesitation, because I’ve never read a bad one yet. This one didn’t break the pattern, but for me it wasn’t quite the unalloyed pleasure of her previous books. This is mostly because of the time travel theme, one that I find tricky at the best of times. I like a nice, linear plot that proceeds at a steady pace from A to Z without too many meandering deviations. Time travel stories start at A, but after that all bets are off. They may proceed to Z, then jump back and forth, or they may abandon all decorum and simply loop the loop and twizzle about like a demented fly. This one felt quite comfortable and I was keeping up nicely until the midpoint when it suddenly went into a Primer-like tailspin and I got hopelessly confused. I felt I should have been taking notes! The other unsettling issue with this book was the characters. None of them quite grabbed me, and at times I wasn’t quite sure who I was supposed to be rooting for. Jace? But he was off the scene for long spells and isn’t terribly likable. Floss? She doesn’t show up until late in the day, and doesn’t seem particularly interesting at first. Quinn? He’s a charmer, but hardly a hero. Kayla? No, not really. The ending felt like a neat way to set things up for the rest of the series, so maybe the problem is just the weight of setup detail. All that aside, the book was still an enjoyable read, and I was never tempted to abandon it. I enjoyed the portrayal of London at different times, and the various futures were very well done. Sometimes people made the transition to a different era too easily, particularly Floss in the future, but this is far better than filling the books with endless descriptions of characters being astonished by changes in technology. I liked the idea that a lot of current technology will survive more or less unchanged over the next thirty years (there’s still email and phones, for instance), whereas other aspects (like human-driven cars) have virtually disappeared. Time travel plays a dominant role in “The Trouble with Time ” with many time travel issues addressed. The basic premise is a brilliantly inverted grandfather paradox. This is where the grandchild goes back in time, kills his grandfather and...blah blah, you know it already. The paradox arises because there’s a question over which history occurred (which affects whether the grandchild exists or not). In "The Trouble with Time" the question comes from the other side – from the viewpoint of the past, Time travel plays a dominant role in “The Trouble with Time ” with many time travel issues addressed. In "The Trouble with Time" the question comes from the other side – from the viewpoint of the past, which future will have happened? Time travel is chiefly used to bring back information from the short term future to ensure that decisions made today don’t have adverse effects for tomorrow. This might be somewhat ontological but I was pleased that the novel avoided the more usual drama of going backwards in time to change the outcomes of wars etc.. The mechanics of time travel aren’t given, but "The Trouble with Time" does have plenty of golden time travel nuggets which keeps the genre alive and in the forefront of the plot! It touches, for example, on time travel tourism (visiting various times and locations in the past) and it introduces a time travel diction such as “timing in” (arriving with time travel) and “timing out” (leaving). Sometimes it seemed that more was bitten off than could be comfortably chewed; sometimes the lack of information seemed too apparent or even vague. For example, “compensatory fuzzy logic” is used to avoid ending up in the same place as another object or in mid air. Without further information on this fuzzy logic, it seems a little superficial. That said, Lexi takes the concept a step further and describes how the “compensatory fuzzy logic” also ensures that a time traveller can’t time in when the destination isn’t clear of oncoming people, trucks and drones. This idea of needing clear space around you is taken forwards where IEMA have time travel-proof holding cells with metal rods and loops to ensure that people can’t time travel into them! This is an interesting twist on time travel. Very quickly after it is invented, the powers that be decide that chaos will ensue if travel to the past is allowed and it is outlawed. Designated officials are allowed limited travel to the future only to avoid problems that might occur for humanity. The twist comes when illegal trips are taken by several persons, each causing a jump, skip, or turn in the plot. Well done. Ce n'est pas le genre de livre que j'aime. Premièrement, j'étais rendue presqu'à la moitié du livre quand l'histoire revient en arrière et recommence. Un tronc commun, mais à un point critique les évènements diffèrent et change complètement la première histoire. Je m'étais attaché à cette histoire, ces personnages et là, bang, changement de cap. J'ai failli arrêter de lire. J'ai continuer, et comme je tournais la page pour lire le prochain chapitre. Je me suis rendu compte que j'étais rendu à la fi Ce n'est pas le genre de livre que j'aime. Je ne lirais pas le prochain tome et je pense que je vais éviter cette auteure à l'avenir. An adventure and twist-filled, suspenseful read. Now that's an enticing beginning of a book, sure ensnared me promptly. Solid, likeable characters, and an antagonist that's so very easy to loathe. . An adventure and twist-filled, suspenseful read. Solid, likeable characters, and an antagonist that's so very easy to loathe. . Thoroughly enjoyed the jaunt around future (and past) London, the well integrated, paradox free time travel and the interesting mix of characters. The remainder of this series is definitely on my download list! Time travel is confusing enough !! Fun stuff! I’ve read LOTS of time travel stories and this one managed to do something none of the others had- surprise me. Criss-crossing timelines, red herrings, dangling clues as to causes of future developments, characters easy to love, and to hate. Started the second one already! I really enjoyed this story and the characters - even the villain. I'll be reading the next book in the series. To be honest, it was always painful to give review with less than 3 stars rating. But I really don't like the story. I don't say it was bad. It just I don't really understand what this story is all about. You can say I am not used with this kind of story. I don't even know who is the main characters. I can understand some people will like it. Unfortunately, I really really dislike it. I am disappointed because I have high hope for this story but it fails me. Actually I really like Jace Carnady a To be honest, it was always painful to give review with less than 3 stars rating. But I really don't like the story. I don't say it was bad. It just I don't really understand what this story is all about. You can say I am not used with this kind of story. I don't even know who is the main characters. I can understand some people will like it. Unfortunately, I really really dislike it. I am disappointed because I have high hope for this story but it fails me. Actually I really like Jace Carnady and Florence character but it still cannot save this story. Jace is smart and kind, Florence also smart and kind. And then you have Ryker who is also interesting character. But the author fail to develop their characters. He/she is much more interested with time travel paradox instead of making enjoyable and engaging story. If the author is willing to tone down and give some semblance to the story, I have no doubt it would make one hell of a story. Unfortunately, that's not what happen. I don't understand one bit how the time travel paradox working in this story. Call me stupid if you want but I am not reading fiction story to learn about science. What makes it worse, the bad guy win every time. Killing him doesn't make him lose because the good guy still die tragically. If the author want to make Quinn as main character, it works badly because I hate him so much. Nothing about him screaming the characteristic of good main character. I keep reading until the end to see whether it becomes better but it seems I set my hope too high. I feel like I wasted my time so much. Anyway, there's my rant. Once again this is just my personal feeling. The Trouble With Time, by Lexi Revellian, is a reverse grandfather paradox time travel story. Many writers of time travel tend to be sloppy with the story and ignore any plot holes under the auspice of time travel wonkiness. I was pleased that Lexi chose to work within the confines of her story, and any loose ends that the story introduced were mostly explained away by the end of the book. A big issue with anthropomorphic time travel, is that there can never be a story, since, as Lexi put it in t The Trouble With Time, by Lexi Revellian, is a reverse grandfather paradox time travel story. Many writers of time travel tend to be sloppy with the story and ignore any plot holes under the auspice of time travel wonkiness. I was pleased that Lexi chose to work within the confines of her story, and any loose ends that the story introduced were mostly explained away by the end of the book. There are a bunch of twists throughout. Some are predictable, but most are a surprise. I love it when a story has a false ending. The book seems to conclude, but there are still a bunch of pages left to read. 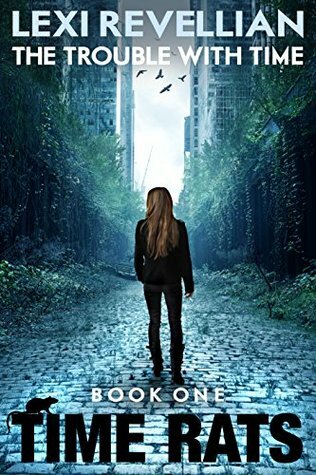 Lexi does a great job with these twists and false endings and overall; the book is an excellent read. My only real complaint with The Trouble With Time is that the story is standard science fiction fare. Nothing got me thinking at a different level or really wowed me with the exception of multiple false endings. I’ve seen some preliminary work on the sequel, Dreams of the Machines, and I’m not sure how Lexi plans to weave the two stories together, but I’m eager to read to find out. Jace Carnady works for the Time Police, the group responsible for tracking down and stopping illegal time travel. He lives in 2045. Floss Dryden is taken from the year 2015 because it is believed her actions will lead to a worldwide event that will end all of humanity. Together, Jace and Floss will have to try and restore their lives as they begin to unravel. Truthfully, I am not the biggest fan of time travel stories. i feel they quite often use time travel to be sloppy in the details of the plo Jace Carnady works for the Time Police, the group responsible for tracking down and stopping illegal time travel. He lives in 2045. Floss Dryden is taken from the year 2015 because it is believed her actions will lead to a worldwide event that will end all of humanity. Together, Jace and Floss will have to try and restore their lives as they begin to unravel. "It's 2045. Jace Carnady works for the Time Police, dedicated to the prevention of timecrime. Life is good; he loves his girlfriend and enjoys his work. But when the team gets wind of a rogue time machine and fails to find it, Jace suspects one of his colleagues may be involved, and his life begins to unravel . . . In 2015, Floss Dryden is snatched from her own time and taken to the future – but will this really prevent the extinction of humanity?" I enjoyed the concept of the time travel. It was "It's 2045. Jace Carnady works for the Time Police, dedicated to the prevention of timecrime. Life is good; he loves his girlfriend and enjoys his work. But when the team gets wind of a rogue time machine and fails to find it, Jace suspects one of his colleagues may be involved, and his life begins to unravel . . . I enjoyed the concept of the time travel. It was a good, fast read (I was on holiday) and finished it quickly. I wasn't sure I'd like this book. The writing is good, the characters have depth, and the world the author has created is well-defined, but the beginning felt rather predictable--bad cop putting the blame of a crime on a rookie. Then it picked up, and the story delved into the time travel and paradoxes. Some of this could have been explained a little better, so it didn't feel like a giant jump from one set of outcomes to another, but after that the story proceeded at a good pace and was easy to I wasn't sure I'd like this book. The writing is good, the characters have depth, and the world the author has created is well-defined, but the beginning felt rather predictable--bad cop putting the blame of a crime on a rookie. Then it picked up, and the story delved into the time travel and paradoxes. Some of this could have been explained a little better, so it didn't feel like a giant jump from one set of outcomes to another, but after that the story proceeded at a good pace and was easy to keep track of--jumping around in three different time periods. I normally love time travel books, even ones that deal with alternate timelines and time being rewritten. Something about this book doesn't seem finished or... polished. Yeah that is the word. The plot is decent but the style of writing feels stilted. I liked the story enough to finish this book but I doubt I will read more in the series. This book is well-written and thought out. It revolves around time travel, which has been declared a crime. Our hero, Jace, is a member of a force that polices time crimes. But things have gone wrong and he becomes a victim. In this story, we have good guys, bad guys, bad that should be good, and good that should be bad. Time flips between decades, and potential paradoxes abound. Not your typical time travel story—no dinosaurs, no Hitler assassination, etc., but a very captivating and extraordinarily well written story. Masterful twists and turns. One of those books that keeps you engrossed and wondering all the way through and beyond. Can’t wait for the sequel. Impressively written, the physics of time travel are avoided in favour of a very personable couple of characters. I was reminded of the muted books in tone but Graham Storrs in personability of character and I look forward to seeing wha happens in subsequent installments. This is my 2nd time reading this and it was really great going back and finding lots of things I did not remember. The future is bleak. Then after a whole lot of stuff the future is b.... nope read it for yourself. Patience is not a virtue of mine!!! NOT FAIR!!! !